20 years ago a farmer friend approached me. He wanted to buy a business in Moscow, but being August, his reserves were all tapped out until after harvesting and selling his crop. For a few months I fancied myself the owner of a used book store. Later the Moscow Food COOP raised funds to move and expand by seeking local private lenders. I was tapped out at the time, but it planted a seed and I wanted to be a local lender again. Recently I got the chance to be help another local business wanting to expand. I can tell you that the satisfaction seeing the business grow is sweeter than just earning interest in the bank. All this is coming into focus again. 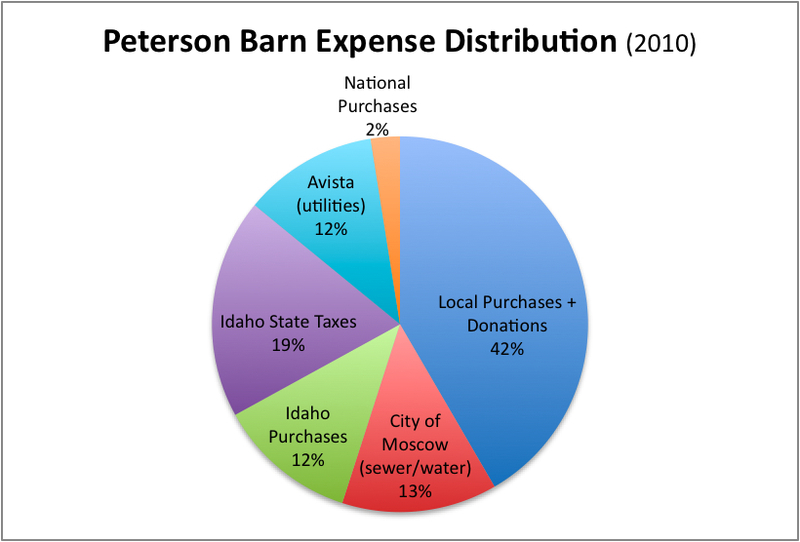 We are doing our taxes on the Peterson Barn Guesthouse and I charted the way the business spends its money. I lumped things into Local (eg Moscow), Idaho (eg statewide), and National (eg everything else). Avista is our biggest National expense and seeing this, it has me thinking about converting it to a local expense. In this case, to reduce spending with Avista we need to make the barn more energy efficient and self-reliant (eg, more solar and sustainable). That will take some spending, a chunk of which could be local labor. And that will take some capital, which could be local. And the expense of paying for that capital would be local spending, rather than national, keeping more of the money in the community. Next step: Decide what energy efficiency steps can be taken and what they might cost implemented in local and sustainable ways. This entry was posted on January 20, 2011 at 12:11 pm and is filed under Growth in Moscow, Reflection-in-action. You can follow any responses to this entry through the RSS 2.0 feed. You can leave a response, or trackback from your own site.